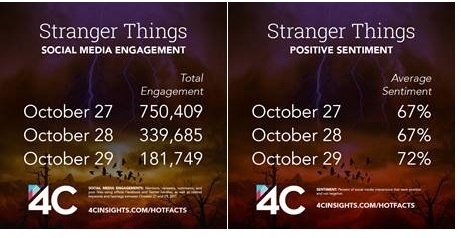 Data science and media technology company, 4C Insights, unveils Stranger Things is closing in on Game of Thrones as the season premiere draws over three quarters of a million engagements across social media platforms (Facebook, Instagram, Twitter etc). · The number of social media engagements rose from 148,063 the night before the premiere (26/10) to an astonishing 750,409 on release day of the show on Netflix, with sentiment almost matching the opening night of the seventh season of Game of Thrones at 68%. 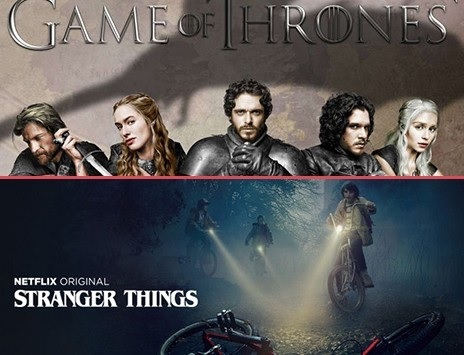 · Compared to the Game of Thrones premiere earlier this year, which raked in 1,114,152 social engagements, Stranger Things has a very strong following on social media for being in its infant stage and only on its second season. · Engagement on social media tailed off over the weekend to 181,749 by Sunday. Nevertheless, sentiment towards the highly anticipated show rose to 72% (29/10), indicating strong reviews from the audience, which had access to the entire season from Friday night. Intriguingly, 31% of the audience of Netflix’s flagship show are over 35. As more and more devices become capable of streaming direct from Netflix, it is reassuring evidence of the content’s cross-generational appeal. Meanwhile, 69% of engagements across the US were driven by 18-34 year olds. Snapchat can claim some credit in this achievement, having taken advantage of the newly launched World Lense feature to create its first fully immersive augmented reality advertising with Netflix. 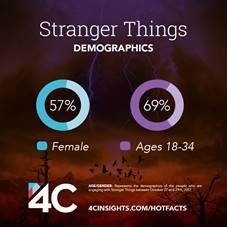 Looking at the demographics it appears Stranger Things now holds a predominantly female audience, with 57% of social noise in the US being generated by women. Stranger Things is one of Netflix’s most marketable original shows, and the return of season two has seen a number of brands release activations to tap into the popularity of the show. Activity includes some special Ghostbusters trainers from Reebok; a shrine for Barb in Topshop's London Oxford Street flagship; character playlists on Spotify; a World Lens on Snapchat that transports users to the 'Upside Down'; a tube takeover at Oxford Street and many more. Engagement: Mentions, retweets, comments and posts likes from Facebook pages and Twitter handles between 26th – 29th October.